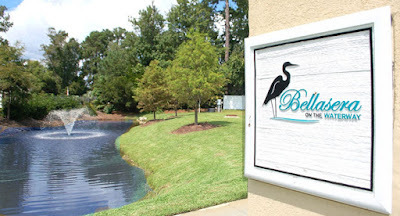 The community of Bellasera is one of the newest offerings in North Myrtle Beach that is ideal for anyone wanting a home close to the beach. The gated community is on the Intracoastal Waterway, close enough to the beach ditch the car for a golf cart ride to all of the Main Street festivals, dancing, and dining. The neighborhood's homes are being built by DR Horton, whose reputation for superior craftsmanship and unparalleled excellence guarantees that your new home will be a source of pride throughout the years. 8 available floor plans provide a variety of choices, assuring you’ll find the perfect fit for your family. One and two story plans offer 3-5 bedrooms, in sizes from a cozy 1400 square feet to a spacious 3000 square feet with room for your family to grow. Hardi-plank exteriors require very little maintenance and with lawn care included in HOA fees, you’ll have lots of time to sit back and enjoy the picturesque view of the waterway. With newly built homes available to move into, you don’t have to wait for dream home to be built if you want to move right away. It’s all up to you! Visit our website to learn more about new homes for sale in Myrtle Beach and then call our real estate experts for a private tour of the new homes in Bellasera.